Please take note of the low temperature on the thermometer. 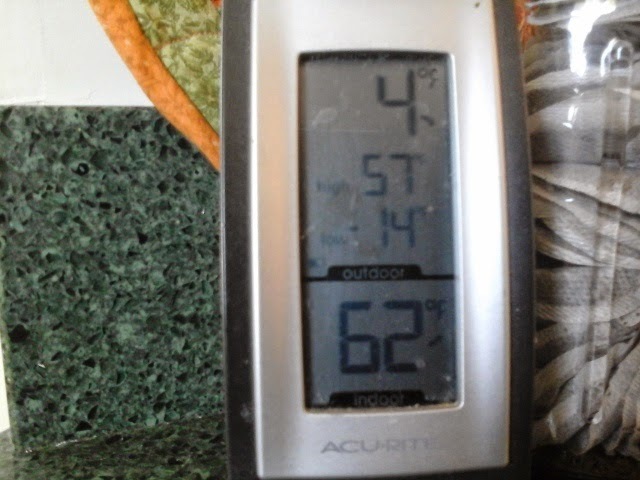 it was 4 degrees by the time i got around to taking this photo, but it was minus 14 when i got up this morning. The windchill was 28 below zero. Thats pretty nippy. The chicken's water was frozen of course, but it was cold enough that even when i very gently poured water from the house on the bowl to remove the frozen solid chunk of ice, the plastic bowl shattered. And, our frost free hydrant froze as well. So i have to carry water out a couple of times a day. One of the big ideas for our homestead is to be as self sufficient as possible. That includes growing as much of our own food as possible, but also means we need to figure out a way to provide some of the livestock feed. Right now, its just chickens, and dogs, if you count them, but it will eventually include a horse and some sheep and goats, maybe a few rabbits and geese. There is enough pasture that we can graze a horse, and a few sheep and goats all year, till winter. Chickens can free range until winter also. Bunnies can eat greens and small branches but they will still need some supplement. So the challenge is to find a way to grow some of the feed needed for these critters. Since it is winter and we obviously couldnt have things already growing, this is a work in progress. But there are things I can do right to grow some of the chicken feed, even in winter. 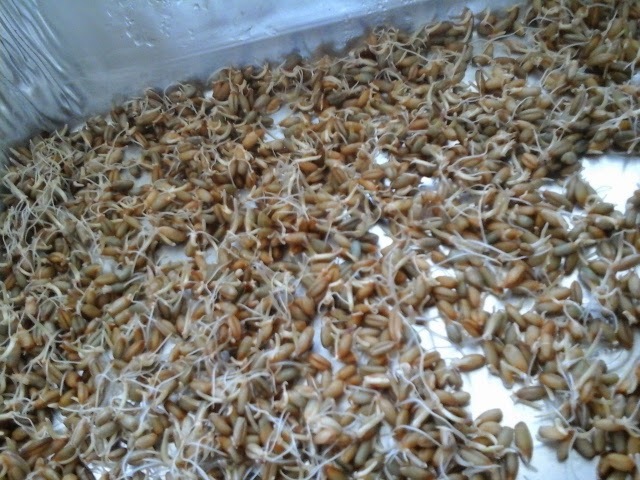 The first thing is wheat grass, or oats, or other microgreens. 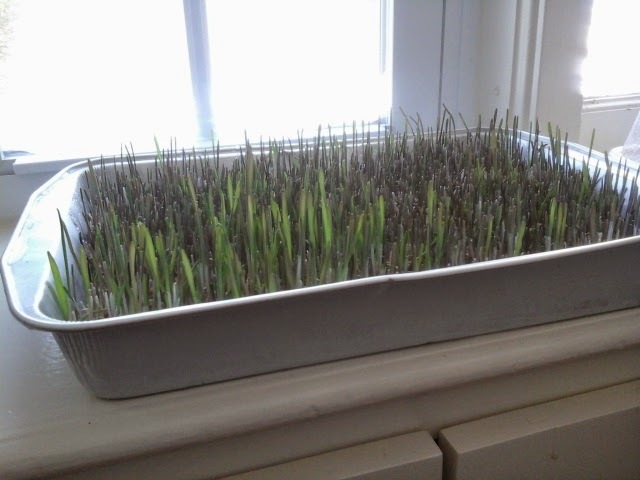 For starters, i am just sprouting some wheat grass. Chickens prefer about 20% of their diet to be greens. It is very simple to sprout a tray of wheat berries, let it grow a few inches, and serve these fresh greens to the hens. They love it. Just like you and me, they woukd rather eat fresh living food than than dry processed "chicken feed" any day. Sprouting any greens is as easy as soaking the grains overnight, then putting them in an open jar, rinsing daily. After a couple of days, they will begin to sprout. Tiny hair like roots and shoots develop after about 48 hours. Then i just spread them out in a tray, put them in a windowsill, and let them grow.. i use the aluminum baking pans with clear plastic lids. The lid allows light through, but keeps tje moisture in. After another couple of days, they are already a couple inches tall. These are now ready to feed to the hens. Since right now, there are just six of them, i will pull out about half of this tray, roots and all, and lay it on the ground in their pen. They will eat it all, roots, shoots, and seeds... and they will love it. The dogs are more problematic. Raising animals expressly for feeding the dogs is not something I really want to do. We do not eat meat, so harvesting meat just for dog food doesnt work for me. We will have the occasional rooster or rabbit that will need to go for one reason or another, and certainly we will not let that go to waste. So i am exploring options. I have a few ideas, including talking to some game processors next hunting season. Today i was able to bring home ten pounds of organic leftover chicken parts, meat, bones, etc. from our local natural grocer. This is human grade. Dogs can eat raw chicken bones, but not cooked ones, so i plan to grind some of this up in the food processor raw and try feeding it that way. I may cook some, remove the bones, and make some patties mixed with a f ew other ingredients. I was fortunate enough to have a friend give me the organ meats from a pig he slaughtered. 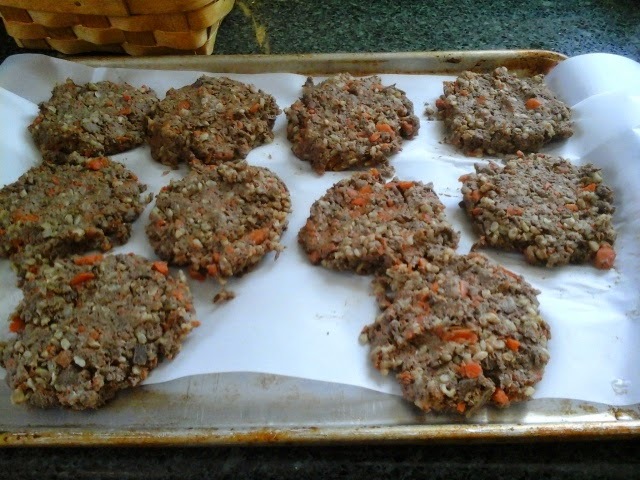 These I cooked, mixed with some cooked rice, carrots, and kelp for minerals. These were frozen on the tray and stored in ziplock. Each patty equals about one cup of dry food. But will they like it? Weather today. Cold, baby! -14 this morning. Wildlife: the turkeys were back. Daily exercise. 4.2 mile easy road run. It was about 10 degrees out, but sunny. Thought for the day. I just want to express my sorrow concerning the awful tragedy in Paris yesterday... my heart goes out to all those touched by these events.